Google Adsense the #1 Monetization service introduces new home page for users. The new home page has simple and clean user interface offers lot of information such as Impressions, Clicks, your Top earning countries, stats and more. 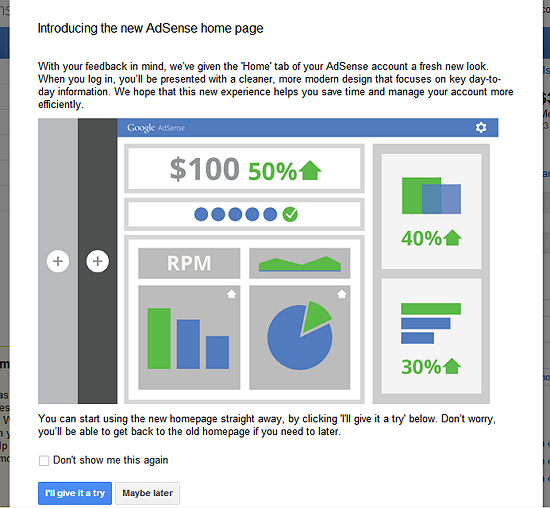 When you sign in to your Adsense account you'll receive a pop-up window about it's new home page. Simply click on the 'I'll give it a try' button. That's all you will get the new look for your Adsense home page. 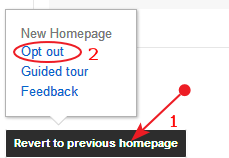 In case if you don't like the new user interface once you enabled it, don't worry you can revert back to your previous homepage at anytime by clicking 'Revert to previous homepage' button which is placed on bottom left corner. Then click Opt out link on the menu. That's all you have disabled adsense new homepage.